Potassium hydroxide and sulfuric acid are two common chemicals used in the manufacture of many different products. When combined, the two produce water and potassium sulfate, the latter of which is also used in manufacturing and in laboratory experiments. Since any of these chemicals can cause skin irritation or burns to humans, take care when working with them. Always read labels carefully and wear proper protective gear. Potassium hydroxide, or KOH, is also known as caustic potash or potassium hydrate, according to its Materials Safety Data Sheet, or MSDS. It looks like a white solid and can also be purchased in a clear solution mixed with water. Sulfuric acid, or H2SO4, is usually a clear solution that may or may not contain an inert liquid to dilute the acid. Sulfuric acid is highly volatile when mixed with water, according to its MSDS. Potassium sulfate is also known as sulfuric acid dipotassium salt or as sal polychrestum, according to its MSDS. Its chemical formula is K2SO4. Potassium hydroxide is used in making soaps and fertilizer, according to the National Institutes of Health. It is also used in laboratory experiments. 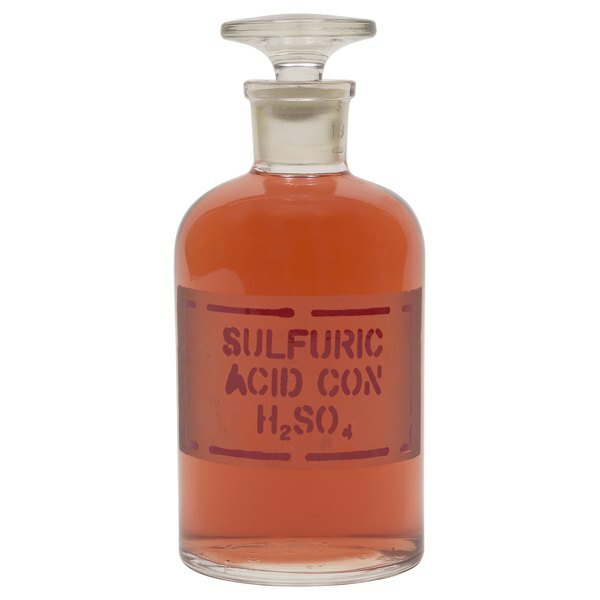 Sulfuric acid is one of the most commonly used acids on the planet, according to its MSDS. It is also used in making fertilizer and in a wide range of chemicals and in research. Potassium sulfate, which is made when potassium hydroxide and sulfuric acid are combined, is used in fertilizer and also to make glass and aluminum. It is also used in fireworks, according to the Hummel Croton Chemical Company. When potassium hydroxide and sulfuric acid are combined, they produce water and potassium sulfate, according to ChemTutor.com. Potassium sulfate dissolves easily in water, according to its MSDS, so the resulting solution often looks merely like a colorless liquid. The water can be evaporated off to reclaim the potassium sulfate left over from the reaction. Both potassium hydroxide and sulfuric acid are highly corrosive and should be handled with great care, according to their MSDS's. Both substances can cause severe burns to the skin, eyes and mucous membranes if touched or inhaled. If ingested, they may be fatal. Always use eye goggles, a face shield, a lab coat and apron and sturdy gloves when handling these chemicals, and handle them only under a vent hood or in an extremely well-ventilated area such as outdoors. Potassium sulfate is not corrosive, but it can cause mild skin irritation, according to its MSDS. Use a lab coat, gloves and eye protection when handling potassium sulfate. Potassium hydroxide is highly corrosive, according to its MSDS. It should be stored in a tightly closed container away from other reactive substances. When exposed to reactive metals like magnesium, potassium hydroxide may release hydrogen gas, which is flammable, according to its MSDS. Never re-use a potassium hydroxide container for other chemicals. Likewise, sulfuric acid is highly volatile and should be kept in a separate container that must be kept dry, according to its MSDS. Potassium sulfate is not volatile, but should be kept in a separate closed container to prevent its being contaminated with other substances.